First Edition published by MLR Press, 2012. 16-year-old Chris is struggling to keep his head above water. His 9-year-old sister is autistic, and as soon as he and his sister get home from school, his mother has to run 'errands' unbeknownst to his father, who is at work. The father believes everything is being handled, between the autistic school, the therapists, and the mother taking care of the girl. Chris is good with his sister, understanding her in a way no one else does. The mother acts as if it's something to be ashamed of, whereas the father sees it as a nonissue dealt with by others. With his sister needing all the attention, Chris' parents don't give him necessary attention, with too much falling upon his shoulders, while they don't take care of their own marriage at the same time. It's a stressful situation, where it could be bettered, but pride and miscommunication always get in the way. There is a mystery thread of sorts – the brooding boy on the cove who keeps himself apart from the rest of the teenagers. This storyline wasn't so much romantic as it was a mystery. What made the boy tick, what were his secrets? Noah kept Chris in suspense too. 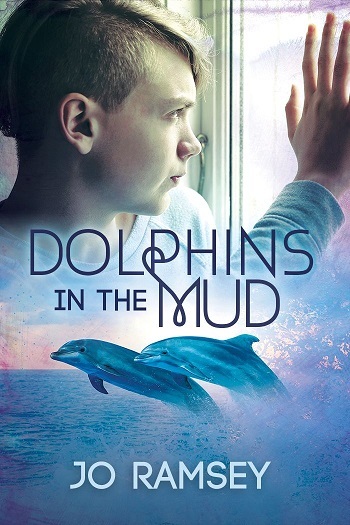 Dolphins in the Mud is a coming-of-age tale, as a young man struggles with adult issues within his family, as well as worries for his new friend, all the while finding his voice. I appreciated how romance didn't overpower the importance of the message. However, the reason I couldn't rate this five stars was the slow-pacing and the lack of spark to keep me hooked. I was intrigued by some aspects, interested in others, but the pacing kept me from emotionally connecting. It was the miscommunication that was my biggest issue. There wasn't a single character who could hold an honest conversation and clear up the problems. This was obviously a plot device to continue the story, used as a conflict, but it just left me feeling as if everyone on the pages was emotionally bankrupt/immature, no matter their age. I felt the autism aspects of Dolphins in the Mud were handled, not only with compassion, but authenticity. The patience needed to make the girl's life run smoothly, the stress when the schedule was off kilter, and the toll this takes out on an entire family. I felt for the mother in the beginning, and it wasn't her absence that changed my mind. Mom's need to look like the perfect mother was the downfall, not asking/accepting help in the need to appear 'normal'. In actuality, she wasn't raising the child any more than Chris was. On weekdays, the girl was at school, then Chris was home at the same time the girl was. On the weekends, it was the whole family. No doubt there was a large toll on the mother, but she had 7 uninterrupted hours per day, to where she could have been running 'errands.' Just felt the need to point out how I wasn't sure when Mom was parenting either child, to be honest. How was that any different than Dad being at work? Chris was struggling, but I do have to place the blame on his shoulders. This is a coming-of-age tale, and as the novel evolved, Chris realized it was the miscommunication/not speaking in general, that was his downfall. I also felt Chris was incredibly rude at times, and I don't just mean to his parents. Chris was devoid of empathy with anyone but his little sister. There was no need to take Brad's mother for granted, treat her so disrespectfully, when she was coming to his rescue for nothing but the goodness of her heart. Entitled. Even in inner monologue, Chris belittled the former special education teacher. It made me think less of Chris, and not see him in a very good light. The woman had no need to be there, to take on the responsibilities of their family because they refused to do it, yet from day-one, they treated Brad's mom like she should just do for them, no questions asked and no thanks given. Also, in regards to Noah, I felt Chris' responses/replies where short and rude ("I snapped") when this thread was meant to be a budding friendship/crush. They were learning who the other person was, but most of their conversations were like reading shorthand, neither giving anything, so the reader also couldn't connect. Both rude, and frankly, I wasn't sure why either would want to spend five seconds together with all the 'snapped' going on. I flinched every time I read it. I won't ruin the mystery, but Noah's answers made more sense dealing with his secret, but what excuse did Chris have for being so short/rude/nasty in conversation? Noah's whiplash made sense, but why was Chris speaking that way too? Often times, I couldn't differentiate between their dialogue if it hadn't been for who was speaking, it was so interchangeably rude. These interactions, which were supposed to feel like budding friendship/crush, felt combative and made me uncomfortable. On the whole, it was refreshing to read a book where the romance wasn't front and center, where actual character building was at the forefront, showcasing stressful lives in a way where the reader could empathize while receiving an education. Young Adult age-range: 14+ due to possible mental health triggers. This is a slow, gritty story of a teenage boy struggling with more problems than he can manage. Chris has recently moved home, leaving his friends and his boyfriend behind. Caring for his autistic sister leaves him with little time to make friends or join teams. And there is something off about the one boy he starts to get to know. As Chris’ problems escalate, he feels trapped by his responsibilities. We only see glimpses of Chris as a person beyond his problems. I felt sorry for Chris but I’m not sure I knew him well enough to really care for him. This story is tagged as a romance but there isn’t really any romance in the book. Chris forges a tentative friendship with a boy who might become something more but the focus is on both boys’ problems, not their feelings for each other. At times, this story reminded me of the topical ‘after school specials’ I remember from twenty years ago. It is a story about difficult family relationships, and it provides an educational introduction to autism and mental health difficulties. A little bit infomercial and a little bit family counselling session, I found myself thinking more about what the author was trying to teach me than about what the characters were thinking and feeling. As a teen, I found this kind of writing quite patronising and I don’t feel much differently now. There were some sweet moments here but the pace is incredibly slow and the character development is disappointingly superficial. JO RAMSEY is a former special education teacher who now writes full-time. She firmly believes that everyone has it in them to be a hero, whether to others or in their own lives, and she tries to write books that encourage teens to be themselves and make a difference. Jo has been writing since age five and has been writing young adult fiction since she was a teen herself; her first YA book was published in 2010. She lives in Massachusetts with her two daughters, her husband, and two cats, one of whom likes to read over her shoulder. Reviewers on the Wicked Reads Review Team were provided a free copy of Dolphins in the Mud by Jo Ramsey to read and review.